Northwestern Medicine scientists have discovered the mechanism driving a protein that influences transcription, a crucial step in gene expression. The study, published in Science, could lead to drugs that control faulty gene expression, a precursor to cancer and other disease. 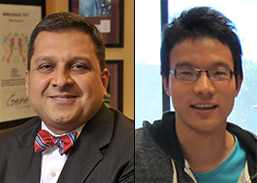 Ali Shilatifard, PhD, the Robert Francis Furchgott Professor and chair of Biochemistry and Molecular Genetics, was the senior author on the study, while doctoral student Fei Chen was the lead author. In a 2015 manuscript published in Cell, Shilatifard, Chen, and other members of Shilatifard’s laboratory demonstrated how a protein called Pol-II-associated factor 1 (PAF1) was responsible for pausing Pol II at certain promotors, holding back the initiation of transcription. While that research established that the removal of PAF1 released Pol II from its paused state, it didn’t explore PAF1’s specific mechanism of action. It wasn’t until Chen began exploring the role of transcriptional enhancers that he and his collaborators identified a connection.